We left La Paz early on the first of November to drive to San José del Cabo. On the way out of La Paz we took Diesel. Again the attendant was very friendly, making sure the gauge was on zero before starting the pump, they even washed our windows. Morning traffic was heavy out of town. Along the road many small Cantinas ( road-side stands ) were serving coffees and breakfast. In sunshine we drove into San José del Cabo. We found our condo at Costa Azul # 6 without any problems. This was our most southerly destination and goal of our Baja California Trip. It was 30 degrees Celsius in the shade. A friendly neighbour let us into the condo , and the rental agent eventually arrived and showed us around. 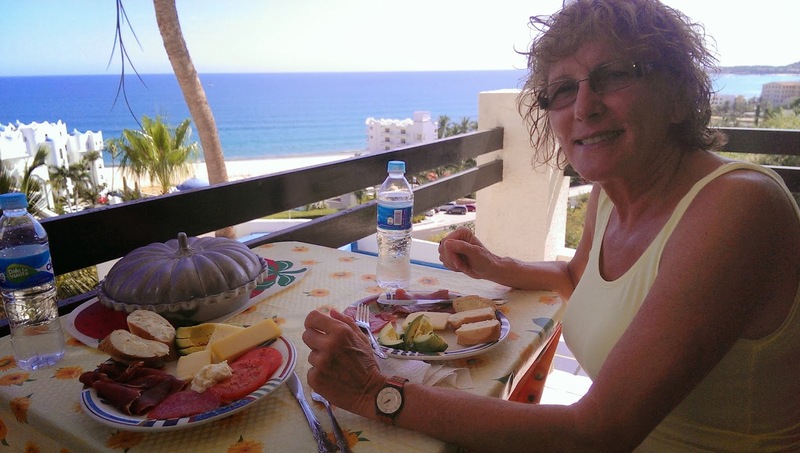 Our condo has a fantastic views over the Playa Costa Azul and the ocean. The inside of the condo looks good. A few things will need attention, like the air conditioner was so noisy we could not have it on when we were there. A tea kettle would also have been convenient. But we settled in and enjoyed every minute of it. Our philosophy is, if you want it like at home, you have to stay at home. We had a nice dip into our swimming pool to cool off after unpacking all our suitcases and all the odds and ends. One of the gardeners had helped us carrying all the stuff up the stairs in the heat. We had arrived, and it was nice to have a perma-base for a while. We set up the lab-tops and logged on to Shaw (! ), and checked the TV programs. The Calgary sports Channels came through loud and clear. Yes strange, but we rented the condo from a Calgary, Alberta person.